I have finished putting the final touches on Chapters 11 - 13 for my VBA book this past weekend. This chapter focuses up working with System Variables, Windows Registry, XData and XRecords. This chapter focuses up on modifying objects that are already in a drawing. It covers things like Mirroring, Copying and many other methods that are used for modifying objects. This chapter focuses on formatting properties of an object. These include work with True Colors along with Layers, Linetypes and Lineweights too. I also take a look at Layer States and how they can be used to help working on drawings. I will give an update on what is going on for the next chapters once they have been completed. As you can see the chapter outline has been revised compared to the original list of chapters that I put together. As I was working through many of the chapters, things came up before they were talked about so I had to revise the order of some of the content. If you have any questions or comments just let me know. I have completed the first 10 chapters of the VBA book that I am working on. This month has been very busy with the new addition to my family and some other things going on. Below is a breakdown of what is in the first 10 chapters that span almost 200 pages, 198 pages to be exact. Covers the commands that are available in AutoCAD for working with VBA projects. A breakdown of what you can find in a code module and what a code module is. You will learn how to work with procedures, variables, data types and general error handling. You will learn how to add controls to a UserForm and how to manipulate both controls and the UserForm at design-time. A look at some of the most widely used functions that VBA has to offer. These include string and data conversion procedures, and working with mathematics. The chapter also covers working with While and For loops, among much more. A look at some of the basic entities that can be added to a drawing and are found in the AutoCAD Object Library. These are objects like AcadObject and AcadEntity which are the base for objects that can be added to a drawing file. Then it starts covering objects like Lines, Circles, Arcs and many others. A continued look at entities that can be added to a drawing, but these are the complex entities. Objects like Polylines, Hatches, Splines and many others can be found in this chapter. This chapter focuses on the Document object which represents the Document window and the database objects that hold the contents of an open drawing file. It also takes a look at the preferences of the Database, Drawing Properties, File Dependencies and how to work with collections. This chapter focuses on the Application object which represents the actual AutoCAD session and allows for accessing all the open drawings. You can also find information about the application preferences, which normally you find under the Options command of AutoCAD. You can find information on how to get information from the user at the Command Line in this chapter. I have also included some information that I have gathered through out the years to help improve the process of working with the Command Line based input methods. I should be complete with the next three chapters over the next couple of days and will post an update after they are complete. Thanks to everyone that has posted comments or have sent me an e-mail on what they would like to see included in the book, so keep the information and concerns coming. I have been working on and off for some time on whether or not to release a VBA book that covers in great depth from what I have ventured down the path in the past. I am proud to announce that I will be going forward with this project and if anyone out there has any feedback to what they would like to see I am open to listening to them. Below is a summary of the chapter titles that will be included in the VBA for AutoCAD book. The book once completed should be some where in the neighborhood of 26 chapters and over 450 pages. I am hoping to have it completed in the next couple of months. I have read many different VBA books throughout the years and some just seem to be way to intense or just not very basic for the beginner. I hope to be able to bring a blend of content that will help those that are new and familiar to VBA programming in AutoCAD. I have been using VBA with AutoCAD since R14 so I have been using it since the beginning. I hope to show a variety of samples that some might have never seen before. Like I mentioned earlier I would like to hear what people would be looking for in a book that they might be interested in purchasing on VBA for AutoCAD. 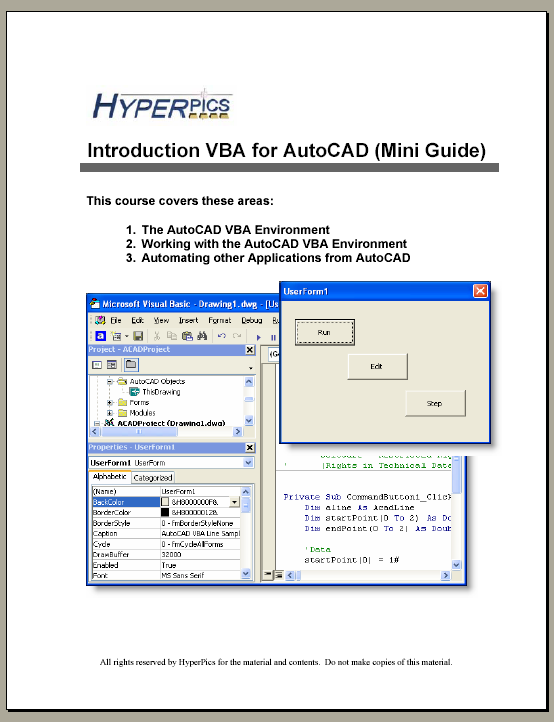 For sometime now I have had some people asking about whether or not I would do an eBook on VBA for AutoCAD. I have had one for a while, but until recently it wasn't up to date. A new version has been created that is a total of 17 Chapters and 169 pages. Typically people want to see a copy of it before buying it which is understandable. So What I have decided to do instead was publish a Mini Guide which contains certain sections of the full version. Below are two links to a scaled down version of the eBook that is titled "Introduction to VBA for AutoCAD". If you are interested in purchasing a copy of the full version just e-mail me, otherwise enjoy the Mini Guide to VBA for AutoCAD without any strings attached. Hope you enjoy the Mini Guide on VBA to AutoCAD. About mid-September, I was part of a re-organization process at work. With many things, re-organizations can be very hard to accept and/or understand the logic behind it. This change was very hard to understand as it just doesn't make sense. So with change there is always confusion and anger, especially when there is no direction presented. So instead of bring this environment home day after day to my family, I tried to keep it at work. Not understanding how to handle such a thing as it was causing problems with my work and home life, I turned to Google. 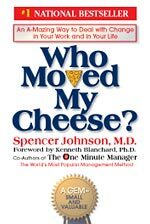 After doing various searches on Google, I can across a concept called "Who Moved my Cheese?". Being a very interesting name and topic, I set out to find the book at my local book reseller. After having the book for a couple weeks and nothing else to do on the flight to San Francisco, I decided it was time to read it. I would recommend this book to anyone that might be facing change at either work or at home. It really breaks things down with a simple to understand approach. After reading the , book I understood in some ways what I was doing wrong and the way that I looked at change. I could see instant benefits in applying the concepts to my work and home life. I have provided a link to the book on Amazon's website below. The book can also be found or ordered from many other sites on the internet or at your local book reseller. You can also go to the "Who Moved My Cheese?" website to get additional information. If you read it or have read it, let me know what your thoughts on it are. What are you going to do the next time some one moves your Cheese? Cheese can be anything that you might be working towards like a new house or even the comfort of your day-to-day job. It is simply the thing or things that make you happy in life, which are usually never the same from person to person. The Cheese is moved when we are faced with change in our lives, little by little or delivered as one large shocking jolt. Wiley publishing and author Ellen Finkelstein have released the latest copy of the AutoCAD Bible for AutoCAD and AutoCAD LT 2005. This is a very easy to follow book with lots of tips and great examples. I had the honor of participating in this project as the Technical Editor for the AutoCAD LT content and it was very well written. There are not too many books out there that cover the material as well as this one does. To learn more about the author Ellen Finkelstein, who is a very nice person, visit her web site at http://www.ellenfinkelstein.com. You can also purchase the book online at Amazon.com or at a chain store like Barnes and Nobles. I would recommend this book to anyone that uses AutoCAD 2005.